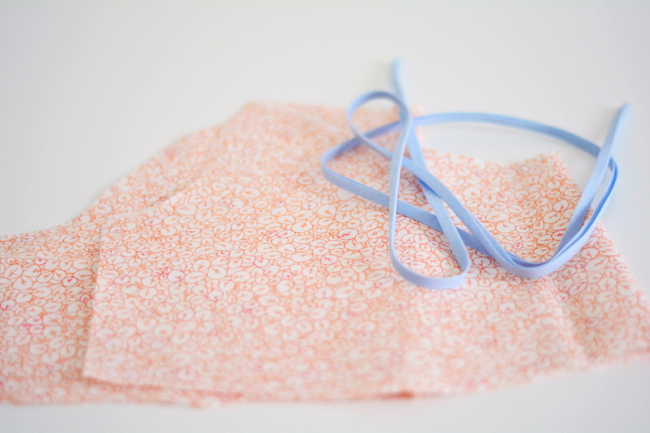 Today, we’re going to go step by step through the process of sewing the bias tape straps for Version 2 of the Dahlia dress. 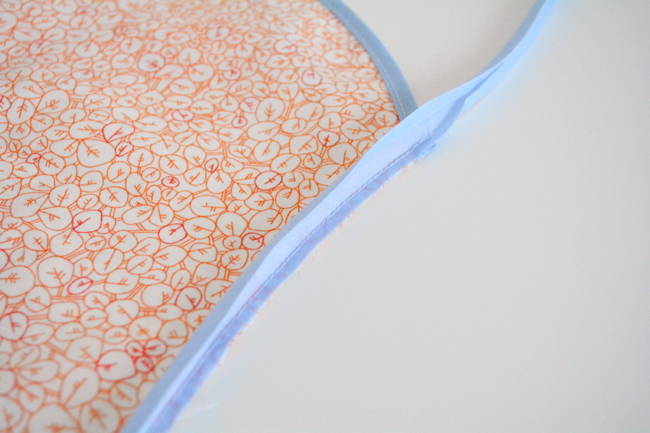 We’ll be using bias tape to both finish the raw edges of the neckline and create the straps. 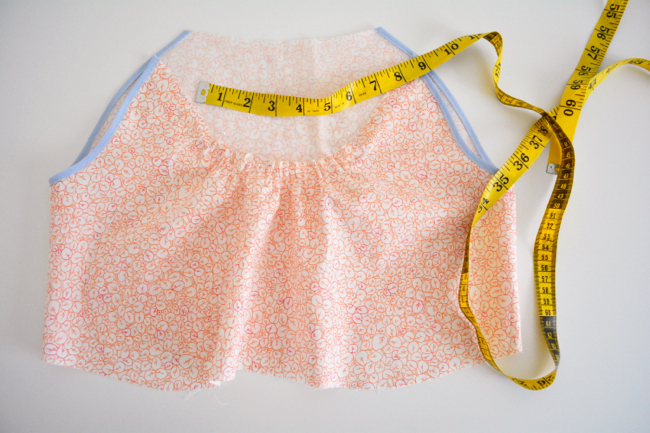 As stated in the pattern, you’ll need 3 yards of ¼” double fold bias tape. You can use prepackaged bias tape, or you can go all out and make your own! 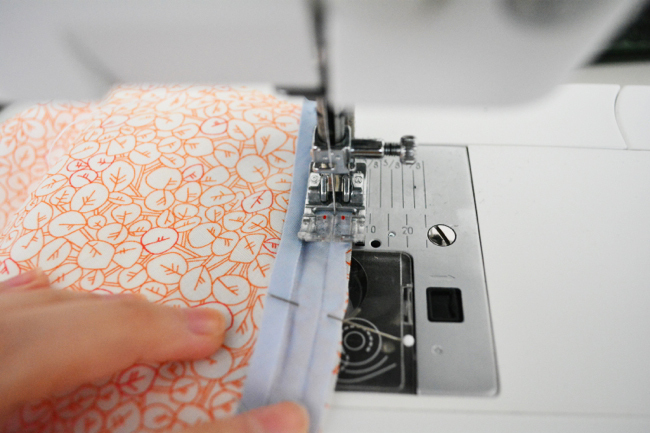 Here is a tutorial for making your own bias tape. 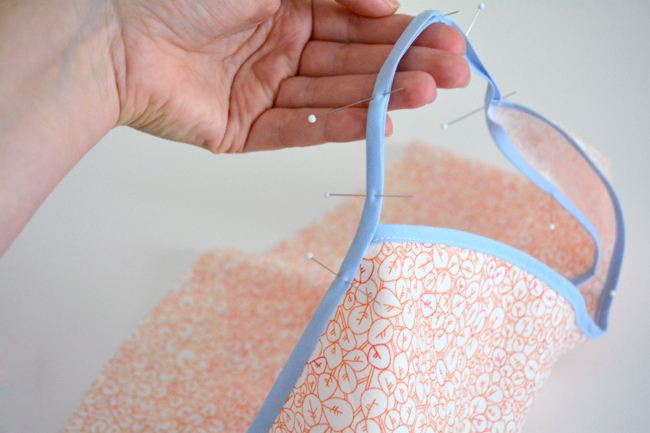 Cut a piece of bias tape just a bit longer than your underarm seam. 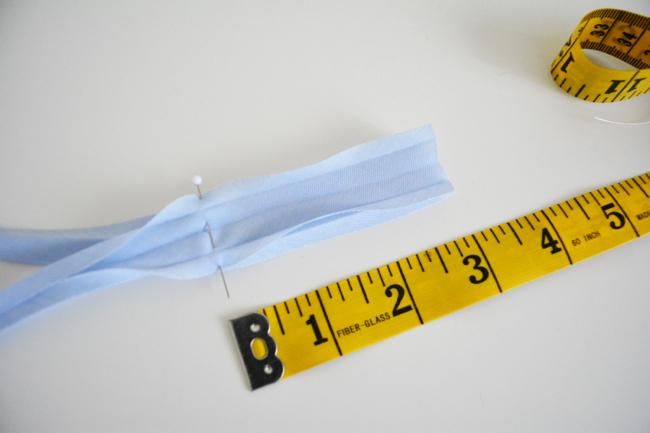 Unfold the first fold in the bias tape and look at the remaining two folds – one is smaller. 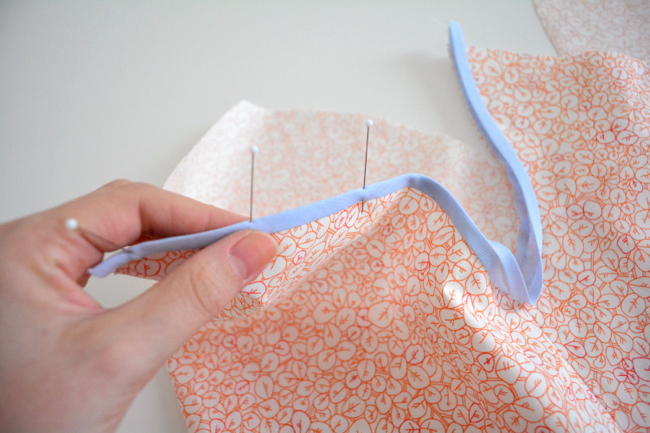 Unfold this smaller fold and align the raw edges of the bias tape and underarm seam, right sides together. 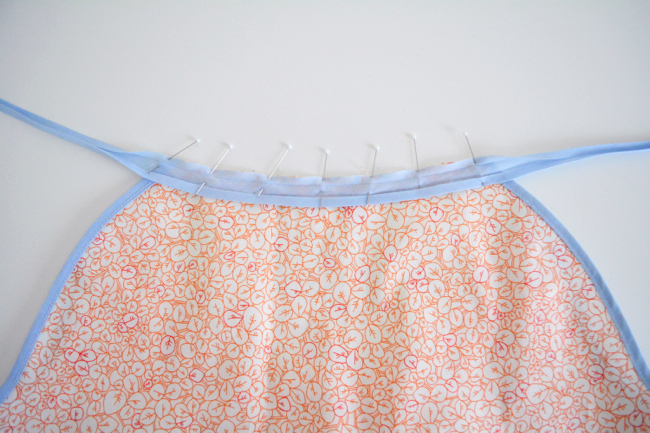 Pin bias tape along entire underarm edge. Stitch bias tape to dress following crease closest to the edge. This should be approximately a ¼” seam allowance. Refold bias tape on creases around the raw edge of the fabric and pin. Edgestitch along inner edge of bias tape through all layers. 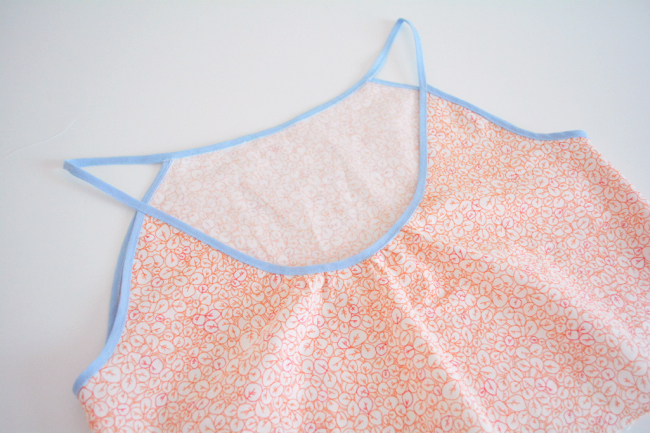 Repeat with other underarm seam. Sew two parallel rows of basting stitches between dots on bodice front. 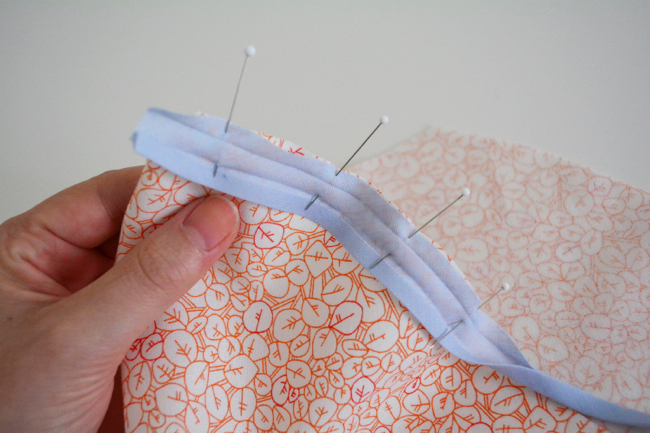 Pull threads to gather fabric down so that it measures 6” between the dots. Anchor threads. 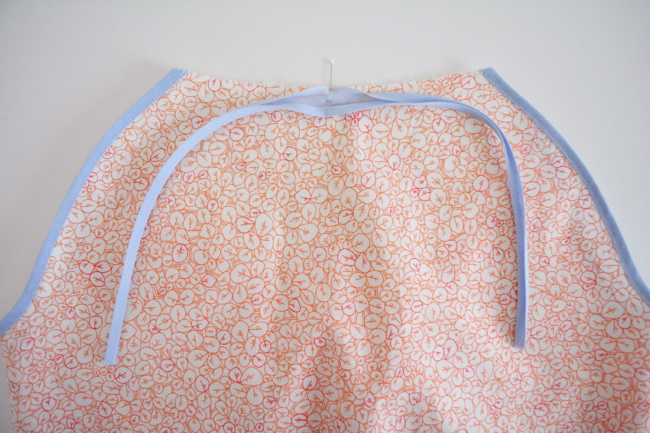 Cut a piece of bias tape that is 5” longer than the back neckline edge on each end. 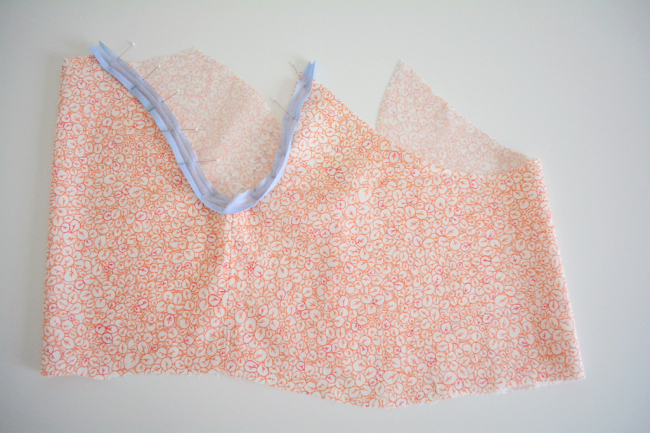 Find the center of the bias tape and back bodice. Open bias tape and pin centers together, raw edges aligned and right sides together. 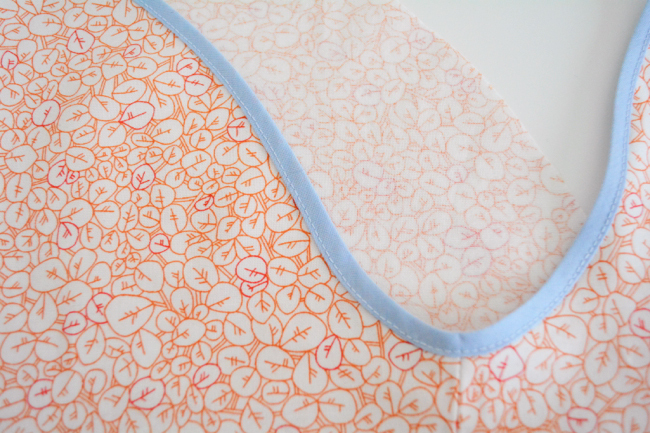 Stitch in first crease along entire edge to attach bias tape to bodice just like you did on the underarms. 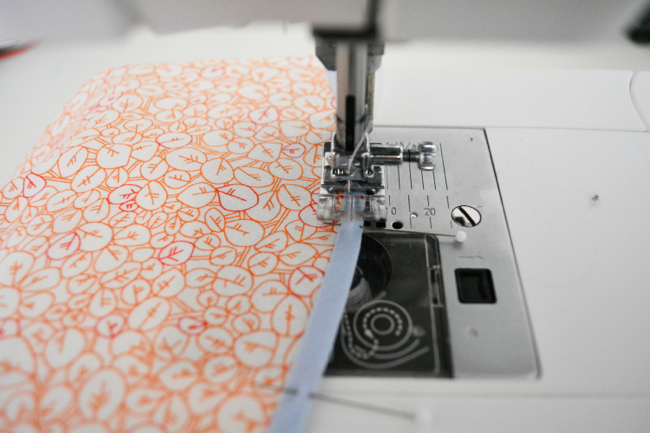 Stop there – we’ll be refolding and topstitching the bias tape later. Repeat to attach bias tape to the front in the same manner. Again, don’t topstitch yet. Mark 3” down from end of each strap. Open bias tape all the way and pin right sides [fold sides] together, being careful not to twist straps. TIP: Mark the outside of each folded strap near the ends and match the marks when you pin so you don’t accidentally create a twist. Try on dress and adjust straps if necessary. 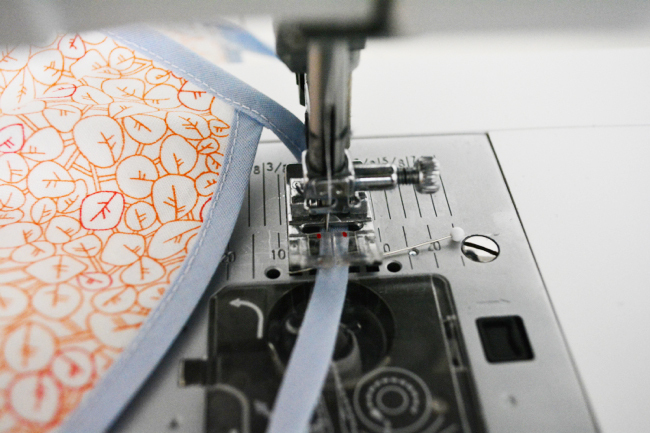 Stitch straps together and trim excess to ¼”. Gently press seam open. Refold bias tape on creases all the way around neckline. Repress if necessary, especially where straps are joined. Starting on the back bodice, edgestitch along bias tape all the way around the dress, stitching along back bodice, first strap, front bodice and second strap. 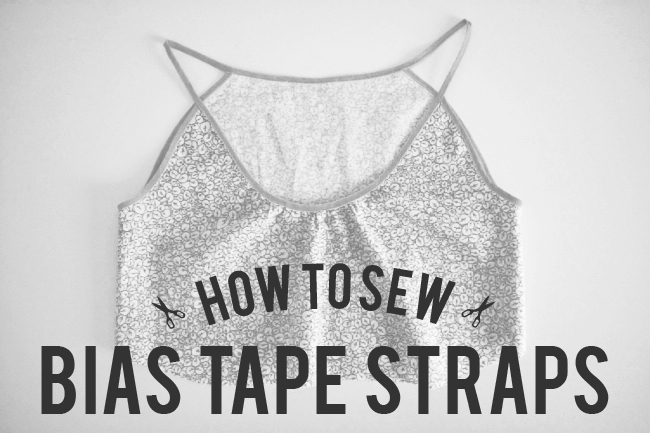 Go nice and slow when you’re sewing the straps. Clips all threads and press gently. Thanks for your huge generosity in sharing. I am really looking forward to the sew-a-long. Have already downloaded pattern and working with plaid guide – all I need now is the hand holding! Love the process of making and sewing bias. Maybe I just think facings are too much trouble. Now I am tempted to start something that requires some bias treatment. You guys do a great job of showing and explaining how to do bias. Well, just about any sewing technique, great job! You didn’t include how to end the underarm edges so that they look flat and professional. I would love to see how you finish this step. Thank you. I’m sorry, I should have said that I realize the tapes edges aren’t closed up where the underarm seam meets, but I would like to see a tutorial on how you handle this. Sorry Amy, I’m having trouble understanding. 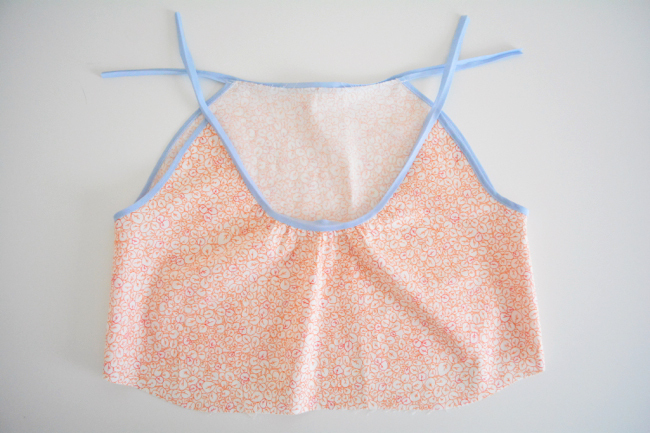 The edges of the underarm bias tape are enclosed by the bias tape that forms the neckline binding/straps. Ditto Tanya’s technique – you’re sewing the seam on the grain, which prevents most poochy seams AND the seam goes around at an angle for less bulk. I’d bury it on the body somewhere, on the back. 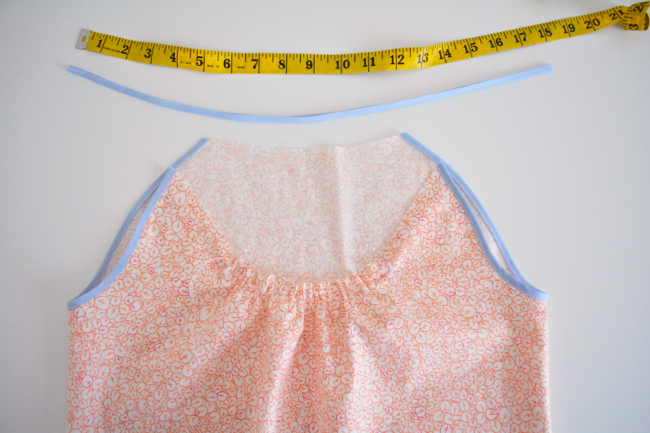 Pin it all out, measure, sew. You can always try it on when it’s half sewn (before the foldover) to check. I’ve ended up threading yarn or narrow ribbon into the straps to keep them from stretching out over time (used a crewel needle for both). Of course, you’re not keeping this dress on the hanger in the closet to exacerbate that. Of course. And it’s something you can go in and do later. SJ Kurtz – neat tip about threading yarn or narrow ribbon to keep them from stretching out over time. Thanks! I have a quick question. I have a largeish chest and usually prefer a slightly thicker strap so that it might hide a bra. Do you think this would work using 1/2 inch bias tape? Would that make a thicker strap or am I wrong? 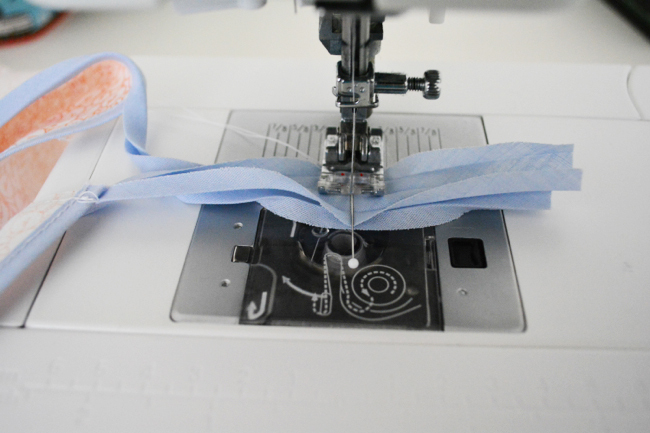 One more quick question as I’m gathering supplies for the sewalong: would fusible 1/4 inch bias tape work? This came at the right time – I am new at sewing. 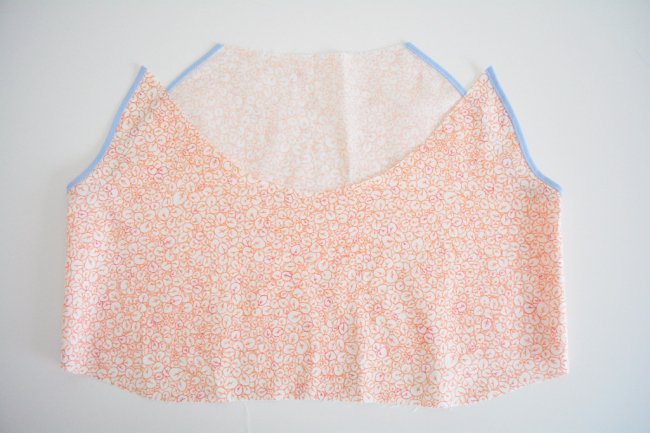 I have a pattern for a blouse that requires bias tape. I feel a little intimidated.